The Samsonite Invoke suitcase set has been designed with all the key features that Samsonite puts at the top of their priorities. With durability, functionality, and innovation key components when designing a new piece of luggage. 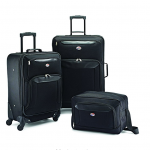 Unlike the Samsonite Centric 3pc Hardside (20/24/28) Luggage Set, you will only receive 2 pieces here, although if you are happy to travel with either a carry-on or a hold suitcase, then this set will work for you. The Invoke set has taken on board the futuristic style that Samsonite envisions, and with the suitcases being made from a 100% ABS material, which is scratch-resistant, they will continue to look like new for many years and trips to come. 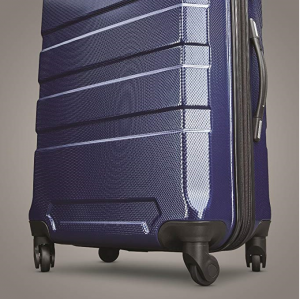 The suitcases are packed full of modern features that you would want, including 360 degrees multi-directional spinner wheels, expandable zips, TSA-approved locks, and more. Being a hard-sided suitcase set, there are not any exterior pockets which may make it slightly more difficult to travel with your documents as an extra bag will be needed. 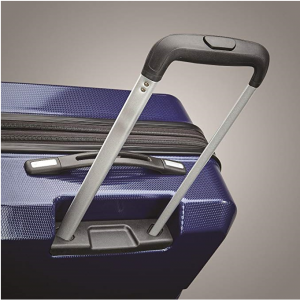 However, this is the norm with hard-sided luggage and should not be used against this set. The Samsonite Invoke 2 Piece Nested Hardside Set has a revolutionary new concept when it comes to interior storage, which enables most of the weight and storage space to be in the main compartment of the suitcase, and not in the lid that opens. Therefore instead of a 50/50 split that is commonplace, the luggage is an 80/20 split, making it easier to open and close the suitcase as the lid is significantly lighter. Inside the suitcase, you will find the main compartment for your clothing, along with an x-strap which will keep it all in place throughout your journey. As well as a mesh zip lined pocket on the inside of the lid, which is ideal for storing loose items and valuables. 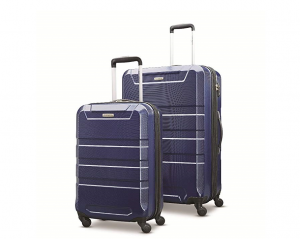 The Samsonite Invoke 2 Piece Nested Hardside Set is made from 100% ABS which is one of the most durable and protective materials available on the market today. The brushed texture ensures that scratches and scuffs are a thing of the past, with the case looking new for a long time. 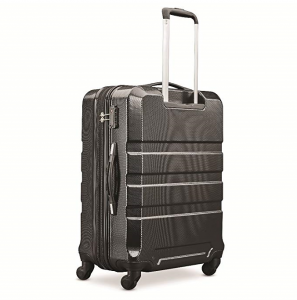 Both cases come with an ergonomic pull-handle system that locks into place, along with 360 degree multi-directional spinner wheels, making it easy to weave in and out of people when trying to get to your gate. If you are looking for added packing capacity, the cases will expand, giving you an extra 1.5 to 2 inches to pack all those things that you wish to. 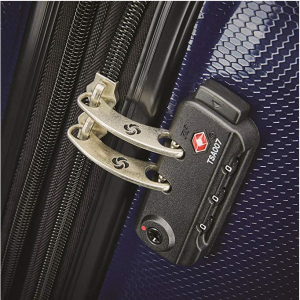 The large suitcase does come with a TSA-approved lock, keeping your valuables safe and secure, however, unlike the TravelCross Dublin 5 Piece Luggage Set w/TSA Lock, you will not receive a TSA-approved lock on your carry-on suitcase. The carry-on spinner suitcase weighs in at 6.8 lbs, which is around average for a carry-on suitcase. Although, with the number of features and protection that the Invoke set has, it can be considered relatively lightweight. You do not have to be worried about the weight of your suitcase, as there is more than enough left in your allowance to take on board what you would like to. 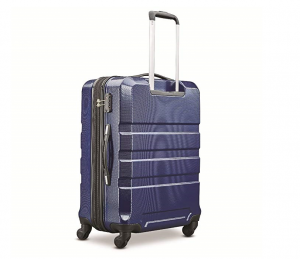 The large suitcase weighs in at 11.5 lbs, which is the same as the corresponding suitcase in the Pathfinder Luggage Presidential 4 Piece Spinner Suitcase Set. The Samsonite Invoke 2 Piece Nested Hardside Set set out to be a durable and hard-wearing suitcase, and that is back by using only the best materials, such as the 100% ABS, providing immense protection for your belongings.  However, previous buyers have noted that the quality is not up to scratch with other Samsonite suitcase sets, and that is something to watch out for. The zippers have been known to break, and that is very rare for a Samsonite suitcase set. It would be best to check the manufacturing quality before using this set, to ensure that it functions effectively and doesn’t leave you hanging when you need it most. The set really does look modern and futuristic, with a brushed texture and horizontal panels, making it eye-catching and professional at the same time. Coming in both black and blue, each with black and silver trim along with the stylish Samsonite plaque, they will fit the part in any setting, whether that is Tokyo, New York, London, or even Barbados. 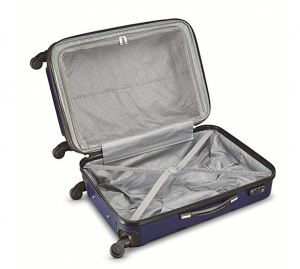 The carry-on suitcase measures in at 20 x 14.25 x 9.25 inches, which is well within the restrictions for most airline carriers. It does expand, so it would be best to check with your airline carrier if you plan on using the suitcase expanded. The large suitcase measures in at 28 x 19.25 x 12.5 inches, which is a considerable size, giving you enough space for a week-long vacation with ease. 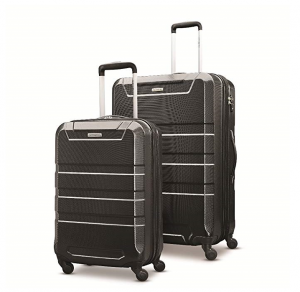 Some suitcase sets such as the Steve Madden Luggage 4 piece Spinner Suitcase Collection has an extra couple of inches on the largest suitcase, marketing at around 30 inches, making them more suited for longer trips away from home. The Samsonite Invoke 2 Piece Nested Hardside Set comes with a limited lifetime manufacturer’s warranty, which is very rare in the suitcase world. It will protect the luggage from material or manufacturing defects. It does not, however, cover misuse, wear and tear, and mishandling, so be careful with this set and it will surely last you a long time. 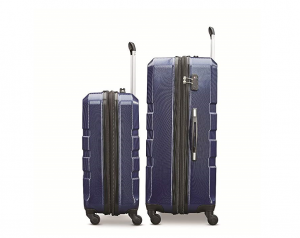 The Samsonite Invoke 2 Piece Nested Hardside Set has been marketed for people who are looking to spend a little bit more money on a suitcase set. You will only receive two pieces, and that may not be enough. The sets are well made on the whole and come packed with modern features that make traveling easier and less stressful.